This is a list of Montana Grizzlies football players in the NFL Draft. Jordan Tripp is an American football linebacker for the Green Bay Packers of the National Football League. 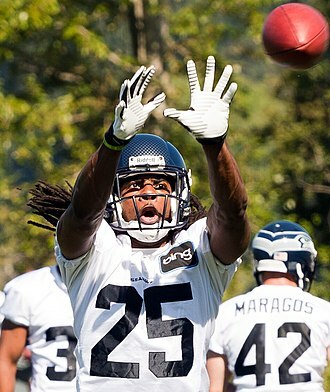 He was drafted by the Miami Dolphins in the round of the 2014 NFL Draft. He played college football at Montana, Tripp attended Big Sky High School in Missoula, where he was a team captain in football his senior year. He was an all-state and all-conference pick as a senior when he had 72 tackles, including 13 for loss, Tripp attended the University of Montana and played for the Montana Grizzlies football team from 2009 to 2013. While playing at the University of Montana, Tripp was teammates with future NFL linebacker Brock Coyle, as a true freshman, playing in a back-up role, he played in all 15 games, recording 23 tackles, and recovering two fumbles, best for second on the team. He started all 11 games and finished second on the team with 99 tackles and he recorded nine tackles for loss, and led the team with three fumbles recoveries. He started in the first three games of the season, but was injured against Eastern Washington and he suffered an injury to his shoulder than resulted in him being out for the remainder of the season. He finished the season with 18 tackles, including 1.5 for loss and he was granted a medical redshirt after the season. He started all 11 games, finishing second on the team with 95 tackles, a team leading 13.5 tackles for loss,5.5 sacks, one interception for 58 yards and he returned a fumble 80 yards for a touchdown against Idaho State. His season lead him to being named a first-team All-Big Sky selection, prior to the start of the 2013 season, Tripp was named the Big Sky Conference Preseason Defensive MVP. He started all 13 games, recording a career high 100 tackles, including 5.5 for loss and he recovered three fumbles, one in the endzone against Portland State for a touchdown. He blocked a field goal late in Montanas 21-14 overtime victory over Cal Poly, after the season, Tripp was named a first-team All-Big Sky selection for the second consecutive season, and was named a first-team FCS All-American by the Associated Press. Tripp was drafted by the Miami Dolphins in the round of the 2014 NFL Draft. The Atlanta Falcons are a professional American football team based in Atlanta, Georgia. The Falcons compete in the National Football League as a club of the leagues National Football Conference South division. The Falcons joined the NFL in 1965 as an expansion team, the AFL instead granted a franchise to Miami. The Falcons are tied with the Dolphins for being the second-oldest NFL franchise in the Deep South, the Falcons played their home games at the Georgia Dome in downtown Atlanta from the 1992 to 2016 NFL seasons. Construction began on Mercedes-Benz Stadium in May 2014, with play projected to begin there during the 2017 season and their headquarters and practice facilities are located at a 50-acre site in Flowery Branch, Georgia. Two years later, the AFL held another exhibition, this time with the New York Jets taking on the San Diego Chargers, in 1965, after the Atlanta–Fulton County Stadium was built, the city of Atlanta felt the time was right to start pursuing professional football. Another group reported it had deposited earnest money for a team in the AFL and he forced the city to make a choice between the two leagues. By June 30, the city picked Rankin Smith and the NFL, former commissioner Pete Rozelle and Smith made the deal in about five minutes and the Atlanta Falcons brought the largest and most popular sport to the city of Atlanta. 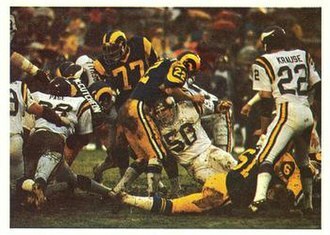 The Atlanta expansion franchise became the 15th NFL franchise, and they were awarded the first pick in the 1966 NFL draft as well as the pick in each of the first five rounds. The Falcons drafted All-American linebacker Tommy Nobis from the University of Texas with the first pick of the draft, the league held the 1966 NFL Expansion Draft six weeks in which the Falcons selected unprotected players from existing franchises. 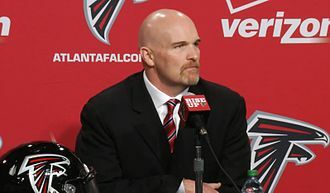 Although the Falcons selected many players in those drafts, they still were not able to win right away. The Atlanta Falcons Football Club received its nickname on August 29,1965, miss Julia Elliott, a school teacher from Griffin, was singled out from many people who suggested Falcons as the nickname for the new franchise. The Baltimore Ravens are a professional American football team based in Baltimore, Maryland. The Ravens compete in the National Football League as a club of the American Football Conference North division. The team plays its games at M&T Bank Stadium and is headquartered in Owings Mills. The Ravens were established in 1996, when Art Modell, who was the owner of the Cleveland Browns, in return, he was allowed to take his own personnel and team to Baltimore, where such personnel would form an expansion team. The Ravens organization has been led by general manager Ozzie Newsome since 1996, the team is owned by Steve Bisciotti and valued at $1.5 billion, making the Ravens the 24th-most valuable sports franchise in the world. The name Ravens was inspired by Edgar Allan Poes poem The Raven, chosen in a fan contest that drew 33,288 voters, the allusion honors Poe, who spent the early part of his career in Baltimore and is buried there. As the Baltimore Sun reported at the time, fans liked the tie-in with the birds in town, the Orioles. After the controversial relocation of the Colts to Indianapolis, several attempts were made to bring an NFL team back to Baltimore. In 1993, ahead of the 1995 league expansion, the city was considered a favorite, behind only St. Louis and this led to public outrage and the Baltimore Sun describing Taglibue as having an Anybody But Baltimore policy. Maryland governor William Donald Schaefer said afterward that Taglibue had led him on, praising Baltimore, by May 1994, Baltimore Orioles owner Peter Angelos had gathered a new group of investors, including author Tom Clancy, to bid on teams whose owners had expressed interest in relocating. 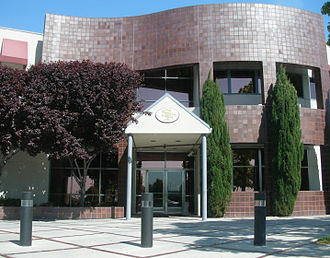 Angelos found a partner in Georgia Frontiere, who was open to moving the Los Angeles Rams to Baltimore. 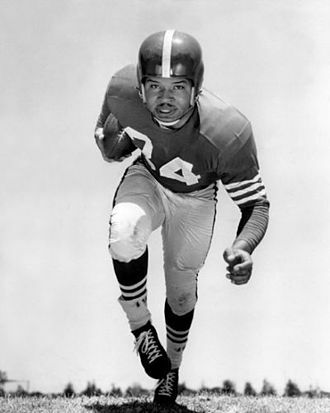 Jack Kent Cooke opposed the move, intending to build the Redskins new stadium in Laurel and this led to heated arguments between Cooke and Angelos, who accused Cooke of being a carpetbagger. Following this, Angelos made an unsuccessful $200 million bid to bring the Tampa Bay Buccaneers to Baltimore, enticed by Baltimores available funds for a first-class stadium, Modell announced on November 6,1995 his intention to relocate the team from Cleveland to Baltimore the following year. The Jacksonville Jaguars are an American professional football franchise based in Jacksonville, Florida. The Jaguars compete in the National Football League as a club of the American Football Conference South division. The team plays its games at EverBank Field. The Jaguars and the Carolina Panthers joined the NFL as expansion teams for the 1995 season, since their inception, the Jaguars have won division championships in 1998 and 1999 and have qualified for the playoffs six times, most recently in 2007. From their inception until 2011, the Jacksonville Jaguars majority owner was Wayne Weaver, the team was purchased by Pakistani-born businessman Shahid Khan for an estimated $770 million. In 2015, Forbes estimated the value at $1.48 billion. 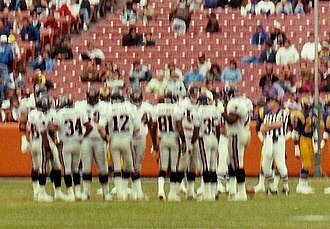 In 1989, the ownership group Touchdown Jacksonville. The group initially included future Florida Governor Jeb Bush and Jacksonville developer Tom Petway, in 1991, the NFL announced plans to add two expansion teams in 1994, its first expansion since the 1976 addition of the Seattle Seahawks and the Tampa Bay Buccaneers. Announced its bid for a team, and Jacksonville was ultimately chosen as one of five finalists, along with Charlotte, St. Louis, Jacksonville was considered the least likely expansion candidate for several reasons. The Jacksonville metropolitan area and television market were smaller than those of every team in the league. There were 635,000 people in Jacksonville proper according to the 1990 census, the Gator Bowl was outdated, and the ownership group struggled to negotiate a lease with the city. The troubled negotiations over the Gator Bowl lease led the group to withdraw from the NFL expansion bidding in July 1993. Charlotte was awarded the first franchise – the Carolina Panthers – in October 1993, the naming of the second expansion city was delayed a month. 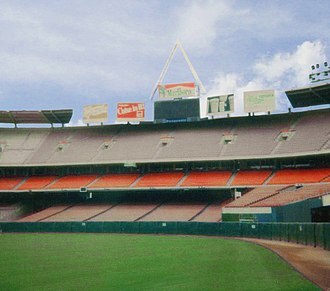 Most pundits speculated that the delay was made to allow St. Louis to shore up its bid, at the time, St. Louis was considered the favorite for the second franchise, with Baltimores three bids considered strong. However, in a move, the NFL owners voted 26–2 in favor of awarding the 30th franchise to Jacksonville. The tight end is a position in American football, Arena football, and formerly Canadian football, on the offense. 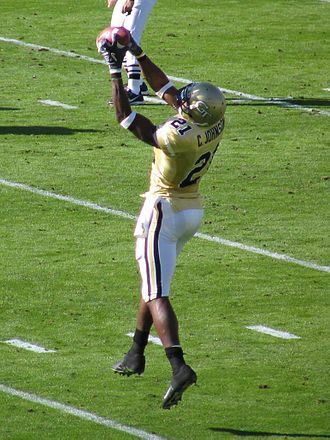 The tight end is seen as a hybrid position with the characteristics. Like offensive linemen, they are lined up on the offensive line and are large enough to be effective blockers. On the other hand, they are eligible receivers adept enough to warrant a defenses attention when running pass patterns, because of the hybrid nature of the position, the tight ends role in any given offense depends on the tactical preferences and philosophy of the head coach. In some systems, the end will merely act as a sixth offensive lineman rarely going out for passes. 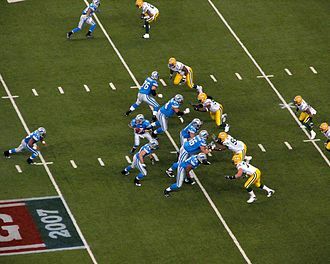 Other systems use the tight end primarily as a receiver, frequently taking advantage of the tight ends size to create mismatches in the defensive secondary. 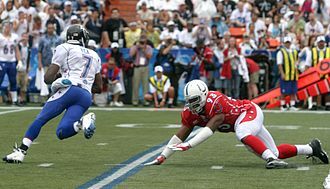 Many coaches will often have one tight end who specializes in blocking in running situations while using a pass catching tight end in obvious passing situations. Offensive formations may have as few as zero or as many as three tight ends at one time. If a wide receiver is present in a formation, but outside the tight end, the offensive coordinator could use the tight end for a fullback. The advent of the end position is closely tied to the decline of the one-platoon system during the 1940s and 50s. Originally, a derived from the games evolution from other forms of football limited substitutions. Consequently, players had to be adept at playing on both sides of the ball, with most offensive linemen doubling as defensive linemen or linebackers, and receivers as defensive backs. As the transition from starters going both ways to dedicated offensive and defensive squads took place, players who did not fit the mold of the traditional positions began to fill niches. Those who were both good pass catchers and blockers but mediocre on defense were no longer liabilities, many were too big to be receivers yet too small for offensive linemen. 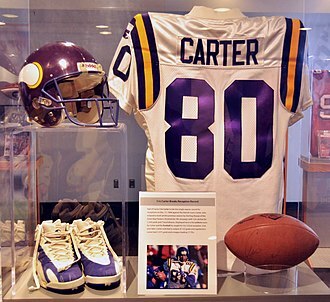 Greater use of the end as a receiver started in the 60s with the emergence of stars Mike Ditka. Until most teams relied on the tight ends blocking as almost a sixth offensive lineman, in addition to superb blocking, Ditka offered great hands receiving and rugged running after a completion. The 2010 NFL Draft was the 75th annual meeting of National Football League franchises to select newly eligible football players. Unlike previous years, the 2010 draft took place three days, at Radio City Music Hall in New York City, New York, with the first round on Thursday, April 22,2010. The second and third took place on Friday, April 23 starting at 6,00 pm EDT, while the final four rounds were held on Saturday, April 24. 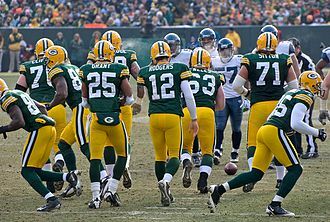 Television coverage was provided by both NFL Network and ESPN, the St. Louis Rams, as the team with the worst record during the 2009 season, selected quarterback Sam Bradford with the first pick. Three of the top four picks were members of the Oklahoma Sooners football team, the prime time broadcast of the first round was watched by 7.29 million viewers making it the most viewed first round ever and making ESPN the second most watched network of the night. Of the 255 players drafted 216 were among the 327 players who participated in the 2010 NFL Scouting Combine and this matches the average percentage of combine participants among draftees over the past ten years. An additional 39 players who did not attend the combine were selected, there was wide speculation that the 2010 NFL Draft would have a very large number of early entrants because of a possible rookie pay scale to be imposed starting with the 2011 NFL Draft. Eligible underclassmen projected as top NFL prospects risked losing millions of contractually-guaranteed dollars if they did not declare for the draft the year before a new CBA could be reached, the early entry deadline was January 15. 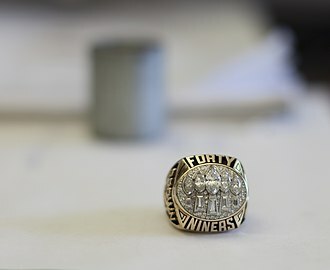 After the early entry deadline had passed, it was confirmed that the 2010 NFL Draft would have fifty-three non-seniors, the drafts first round, in which teams were allowed ten minutes to make each selection, consumed three hours and 28 minutes. The second round lasted two hours and 25 minutes, after the second round, teams were allotted five minutes per pick. The third round took one hour and 41 minutes, rounds 4 through 7 each lasted less than two hours. For the second time in history, the first two players selected were named Offensive and Defensive Rookies of the Year, respectively. Harry Gilmer catching a football. 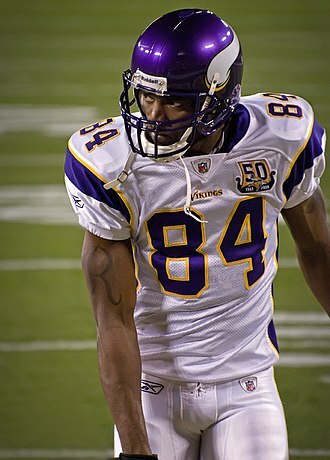 Jason Taylor was the 2006 NFL Defensive Player of the Year. The 2015 MVP Cam Newton was drafted first overall in 2011 by the Carolina Panthers. Art Modell moved the Browns to Baltimore and remained the owner of the Ravens through 2003. 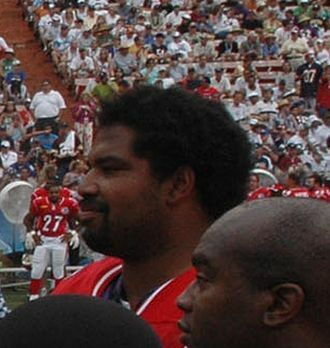 Jonathan Ogden at the 2006 Pro Bowl. Ogden played offensive tackle for the Ravens from 1996 through 2007 and was elected to the Pro Football Hall of Fame in 2013. 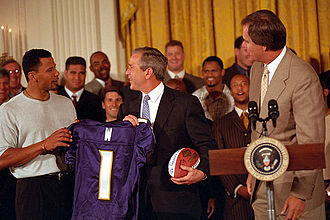 The Ravens meet President George W. Bush in 2001. Bush is at center. On the left is Rod Woodson, and on the right is Brian Billick. Coach Gary Zauner (front) and Brian Billick with the Baltimore Ravens in 2003. The Falcons' defense taking on Denver Broncos quarterback John Elway during a 1985 game. 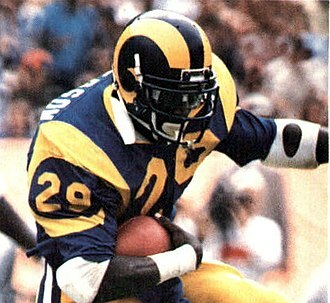 The Falcons playing against the Los Angeles Rams during a 1991 away game. 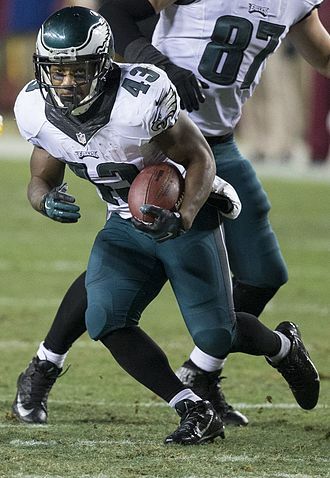 Wilson celebrating with teammate, Sean Smith, in 2012. Hilliard with the Dolphins in 2009. Since being the first overall pick, Andrew Luck has been a 4× Pro Bowl selection and led his team to the playoffs in four out of the last seven years.